If you’ve ever met a beer-drinking horse, it makes more sense than you might think. Beer brewers use yeast to convert sugar into alcohol; brewer’s yeast is the byproduct of that fermentation process and most horses enjoy it. 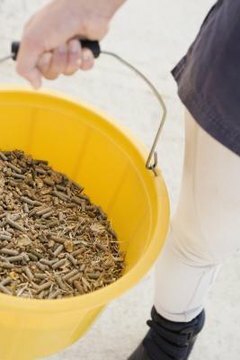 Before adding it to your horse’s diet, check the nutrition label on your feed bag—many commercial equine feed manufacturers already add brewer’s yeast. They may also list it under the scientific name Saccharomyces cerevisiae. When it comes to food, horses are not that different from people: unless they’re extremely hungry, they like to eat what they like and will balk at foods they don’t. But horses are much more sensitive to changes in their diets than humans—not just changes in type of food, but also changes in quantities. Some are more sensitive than others, and inconsistent eating patterns can increase the likelihood of digestive disorders such as colic. Adding an ingredient to their feed that makes it taste better helps mitigate that outcome by contributing to a more consistent food intake. Brewers' yeast is an excellent source of several B vitamins. However, unless your horse is in a challenging work program he likely doesn’t need vitamin B supplementation. The exception to this is if he suffers from a B1, or thiamine, deficiency. If your horse is young and just getting into a training program but seems a bit tired and depressed, check his thiamine levels. Another symptom of thiamine deficiency is decreased appetite. Your horse will likely benefit from biotin, another B vitamin. Hoof supplement manufacturers add biotin to strengthen hooves and maintain hoof health. If you are looking for a way to add protein to your horse’s diet, brewers' yeast is a viable option for high-quality protein. It also contains phosphorous, selenium, iron, zinc and chromium. Talk to your veterinarian or an equine nutritionist before adding additional protein and phosphorous. Too much protein can cause your horse to sweat excessively, which can lead to dehydration. If he gets more protein than he needs, he’ll excrete it, creating unhealthy ammonia in his living environment. Your horse may need additional phosphorous if he is on a diet high in calcium, to achieve a proper calcium-to-phosphorous ratio. Typically, however, it’s calcium that horse owners need to worry about, since your horse should get about twice as much calcium as phosphorous. When you think of brewers' yeast you may automatically think of digestive benefits, since yeast is used for equine probiotic supplements. However, those probiotics contain live yeast organisms, and brewers' yeast organisms are dead. Your horse may or may not receive digestive benefits from brewer’s yeast, but digestive research on horses is not conclusive. At a minimum, and considering its other benefits, adding it won’t hurt him. University of Minnesota/Extension—Horse Extension: Can Brewers Yeast Improve Digestion and Foot Health?